New Delhi: The Indian Institute of Technology, Ropar has signed a Memorandum of Understanding (MoU) with the National Institute of Electronics and Information Technology (NIELIT) Ropar today. 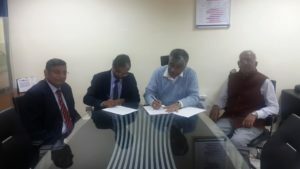 The MoU was signed by Prof. Sarit Kumar Das, Director, IIT Ropar and Dr. Ashwini Kumar Sharma, General Director, NIELIT. The objectives of this co-operation include fostering collaboration, provide opportunity for global experience and to facilitate the advancement of knowledge on the basis of reciprocity, best effort, mutual benefit and frequent interactions. The institutes agree to explore the possibility of engaging in the areas of collaboration like exchange of intellectual know how and resources, partnership in innovation and entrepreneurship driven opportunities and resources, sharing of network and infrastructure resources, partnership of collaborative consulting and research projects. Both the institutes will work jointly to establish academic, network and research co-operation in general and to co-operate on the activities set forth in this MoU.